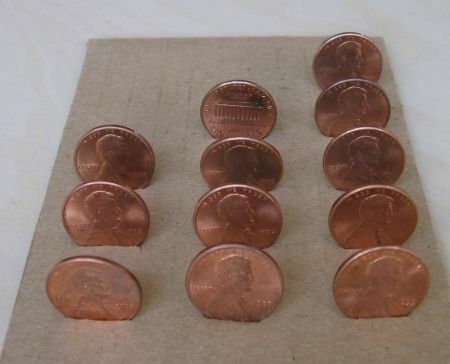 Think of each penny as one bit, with heads meaning 1 and tails meaning 0. Each column is read as a binary number, from top to bottom. Left column: Day of the week. The days of the week are numbered 1 through 7, indicating Sunday through Saturday. The day of the week is 101, which is 5, so it’s Thursday. Middle column: Month. The months are numbered 1 through 12, indicating January through December. The month is 0001, or 1, so it’s January. Right column: Day. The days are numbered 1 through 31, indicating the 1st through the 31st. The day is 00001, or 1, so it’s the 1st. Saturday, July 31st, in pennies. When I swim, I count both my laps as well as the number of strokes per lap. which lets yo count beyond a million just using your fingers and toes – right? Hint: use your fingers for the least significant bits as they change the most. Yes, 2^20 – 1 = 1,048,575 positions. I’ve tried counting in binary on one hand but it’s kind of hard to do without getting help from the other hand (to keep the bits either up or down and not “indeterminate”). Two hands would be hard. Forget two feet too! There’s lots written about binary finger counting. 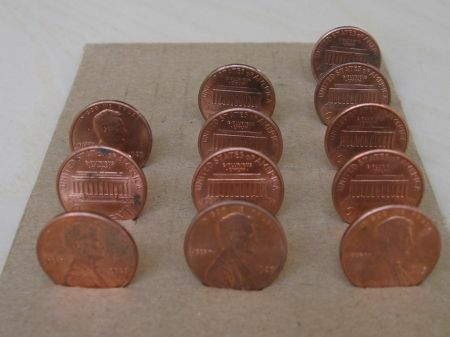 Here’s one video showing counting to 31 on one hand: http://www.youtube.com/watch?v=z8p-tLD5E5A“. It uses “negative logic” though — I prefer finger up = 1, finger down = 0.